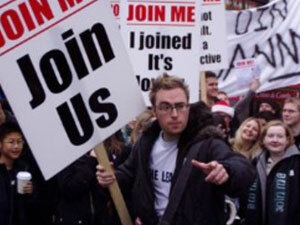 When London based journalist Danny Wallace placed an ad simply reading ‘Join Me’ back in 2001, he was amazed when large numbers of people reacted to join him. Danny didn’t have a plan prepared for what to do with all those people. So he thought about it a little. He could get his ‘joinees’ to use their powers for Good or for Evil. The decision was an easy one. They would go about doing Good. 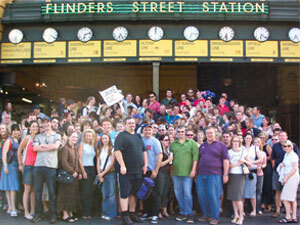 By now the group carries the name Karma Army and consists of more than ten thousand people. They are invited to do a good deed every Friday, called Good Friday. Friendly deeds might be bringing a stranger a cup of tea, carrying a heavy bag for an elderly lady or giving a homemade ‘Best hat of the year’ certificate to somebody on the street who’s wearing a nice hat. Participants report on their actions to inspire one another. 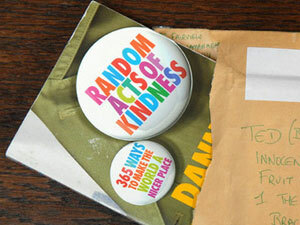 Using their contributions, Danny Wallace wrote a booklet titled ‘365 Random Acts of Kindness’. By now Danny Wallace has become quite a celebrity. For the BBC he made a TV series called ‘How to Start Your Own Nation’, in which Wallace actually founded a new country in his flat. He gathered citizens, had a national anthem composed and traveled to New York to apply for recognition by the United Nations. His project Yes Man entailed saying ‘yes’ to any request for six months and endure the consequences. Wallace wrote a book about his experiences, which formed inspiration for a movie starring Jim Carrey, set for a 2009 release.